Top Quality Brick Ovens using Wood and Gas to cook Pizzas and many more. Space Saving and Affordable Brick Ovens. VALORIANI VERACE, a technologically advanced oven, result of the centuries-old experience of Refrattari Valoriani, of its engineers supported by the ASSOCIATION OF GENUINE NAPOLITAN PIZZA. R.H.S.® ( Re-cycling Heating System) is the patented system which allows the heat’s recover and utilization, making it flow at high temperature under the oven’s floor and inside the oven. Thanks to the R.H.S.® system, the floor’s temperature is uniform and steady also in those areas far from the heat source, the combustion is adjustable and the consumptions are very low. Moreover, the quality of the emissions into the atmosphere results to be better compared to the strict laws on this matter. VALORIANI VERACE does not want and cannot replace the skill and creativity of the pizza-maker but it allows him to maximize his skills. The most recent Valoriani oven perfect to be used in every environment, the first domestic oven with professional features. It is ready for use, light and handy - either by hand or on wheels - to meet space and movement requirements. 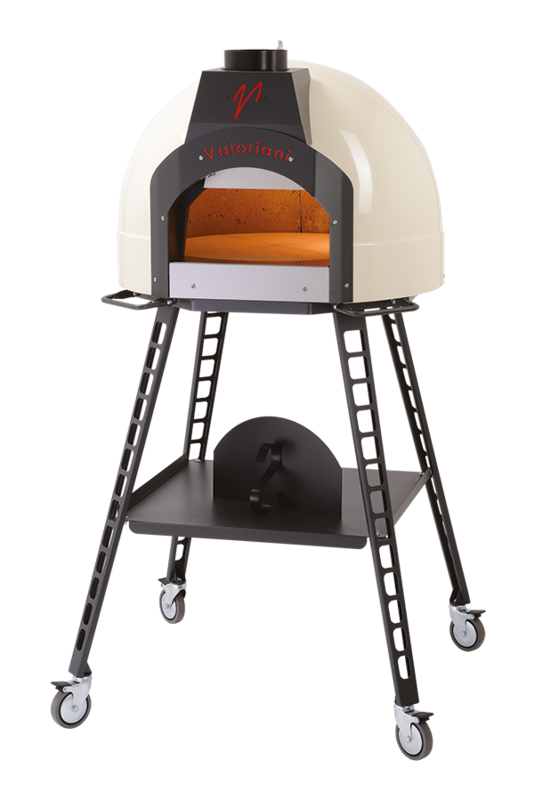 The BABY VALORIANI can be wood or gas fired. An oven designed not only for families who wish to have professional quality at home, but also for pizza professionals who need a practical and transportable oven fitting every situations. Outside dome in painted metal. Dome in refractory conglomerate of professional quality. Baking floor in refractory cotto.